Headaches? Massage helps to relieve them. Many headaches are caused by stress, dehydration, or poor posture. Stress headaches can be relieved by removing the source of stress or finding a way to manage it. Massage, yoga, exercise, meditation, or anything that helps you relax will keep your stress levels down. Dehydration means you are not drinking enough water. That’s a simple fix, drink more water. A gallon a day is the usual recommendation (unless you have a kidney condition). Poor posture, particularly a forward head posture, can result in tight neck muscles that impair circulation and cause discomfort. The human head weighs about ten pounds. 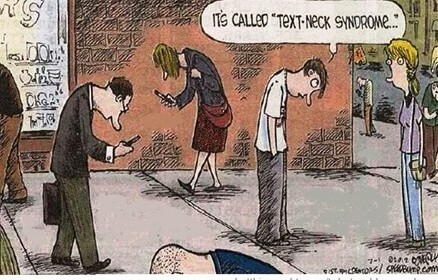 The neck will support the head well if it’s aligned directly over it. If not, the muscles at the back of the neck will struggle to keep the head from falling forward. According to Dr. Kapandji, author of Physiology of the Joints, Vol. III, for every inch your head moves forward, it gains 10 pounds in weight, as perceived by the muscles of the upper back and neck. This shift in weight causes the muscles at the base of your skull to contract and puts pressure on nerves. This pressure causes headache pain at the base of the skull or around your facial sinuses. Go out in public and watch the posture of people staring at their smartphones. Dr. Dean Fishman, a Florida chiropractor, has coined the term “text neck”, to describe a forward head posture as a result of using smartphones or other handheld electronic devices. After a while the natural curve of the neck flattens out and the muscles of the anterior tighten up while the muscles of the posterior neck and upper back are strained to the point where a small hump develops, leading to a hunchback appearance. Another effect of this posture is the development of trigger points. A trigger point is a hyperirritable spot that refers pain to another area of the body. Trigger points in the neck and upper back can cause tension or migraine headaches. The massage therapist will locate the trigger point and then apply enough pressure to reduce or eliminate it. The muscle then softens and the pain goes away or is greatly reduced. Soothing strokes then help to flush away lactic acid that is released. Lactic acid is part of the “soreness” you feel, it’s a waste product that is left over from muscle contractions. Releasing the trigger point releases the muscle contraction and stops more lactic acid from being produced. We do trigger point therapy at Woodstown Massage Boutique, but we include it as part of Deep Tissue Massage. We also practice other techniques to help you get rid of that headache. If you are looking for headache relief what are you waiting for? Call us or go online and schedule an appointment, and start feeling better. Important Note — Sometimes headaches are a symptom of a disease or the result of a head injury, if a headache is continuous for 24 hours or more, please see a doctor for proper diagnosis and treatment. ← Bill Does Sports Massage Therapy! Well it all depends on the stage of illness you’re in, and what type of symptoms you have. Bottom line, after you’re done the half-way mark with the cold, then yes you can get over it quicker with massage. Same is basically true at the onset (as long as there’s no fever) but the thing is, you’ll feel worse for a period of time, during which your system is overloaded with the illness. Plus there’s also a chance of taking a local infection into a systemic one. So to be safe, just wait til you feel better. And if you are interested in the herbal compress this is a great way to ward off that sluggish feeling.